We were all deeply saddened to learn of the untimely death of Chris Hogwood last month. His was a delightful presence when he visited the UL Music Department and he is much missed. Others have eloquently expressed his seminal role in the establishment of historically informed performance, so what we would like to do in this little celebration of his life is to share some personal memories. Charles Cudworth’s copy of the Pembroke May Week programme. Chris Hogwood provided the continuo. Programme for the 1980 IAML Congress given by Chris Hogwood and the AAM. Walsh’s edition of Corelli’s op.5, from the F. T. Arnold bequest [MR360.a.70.9]. A modern edition by Chris Hogwood was published in 2013. “In October 1961 I came up to Fitzwilliam House (then in a rabbit warren of a building opposite the Fitzwilliam Museum) to read law, but hoping, as a young flautist and enthusiastic recorder player, to partake fully in the musical life of the College. Alas, musical life in Fitzwilliam was then pretty scanty, with only one undergraduate in the two years above me reading music (so Peter Tranchell, as Fitzbilly’s Director of Studies in Music, was fairly invisible to me). I hasten to add that things soon bucked up, as in my year there was Nicholas Marshall, the composer, and in the following year the NYO clarinettist and future conductor David Atherton – and of course today music in the College in its Storey’s Way / Huntingdon Road site flourishes abundantly. 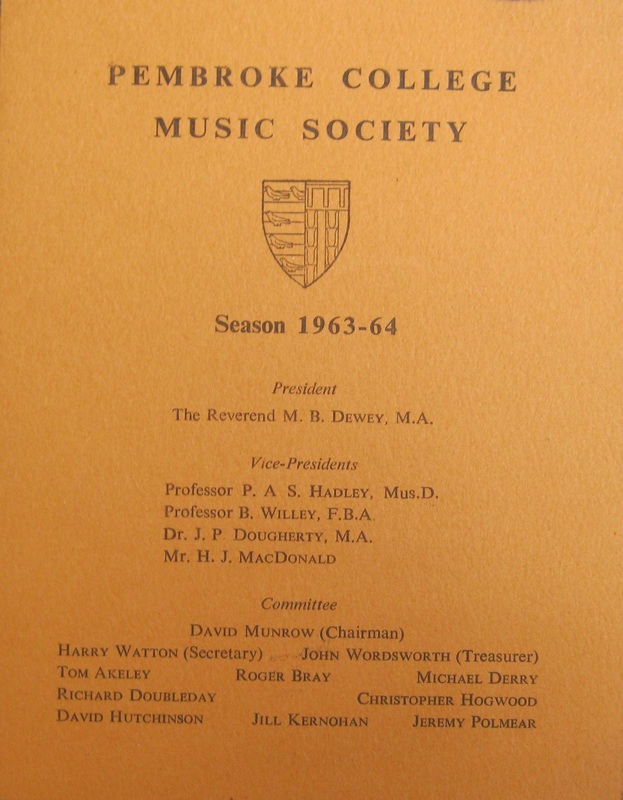 The 1963 – 64 concert listing for Pembroke Music Society. So initially I felt bereft of musical stimulation. My saviour was Chris, whose digs were just round the corner at no. 1 Fitzwilliam Street, on the ground floor, and he could often be seen through the window playing his clavichord. My first performance in Cambridge was arranged by Chris, and we played together the Frank Martin Sonata da Chiesa for flute and organ in the Round Church (perhaps Bach as well, but I now forget the details of the programme). Undergrads Christopher Hogwood and David Munrow. 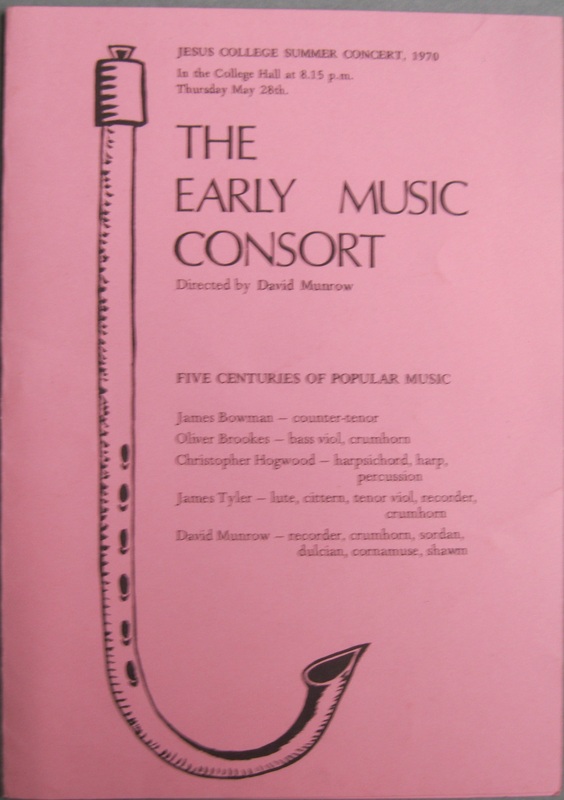 Jesus College’s summer concert for 1970 given by the Early Music Consort. It was of course Chris who introduced me to musicians at Pembroke College, including John Fletcher (then playing horn but subsequently to become the country’s leading tuba player) and particularly David Munrow, who changed the course of my life. I played in several of the intimate concerts put on by the Dean, Meredith Dewey. Chris had a passion for the clavichord at that time, and even persuaded me, along with Jerome Roche, Bill Eden, Julia Hadingham (now Usher) and others to write him pieces, which I hope are now destroyed! Our connection continued after I left Cambridge and qualified as a solicitor, through David Munrow’s Early Music Consort of London, of which he was a founding member, along with James Bowman, Oliver Brookes and Mary Remnant, and I remember a happy afternoon at Chris’s house playing through numerous flute duets on baroque flutes with Nick McGegan, and discussing his plan to found a British orchestra of original instruments, for which with my legal hat on I prepared the initial constitution. 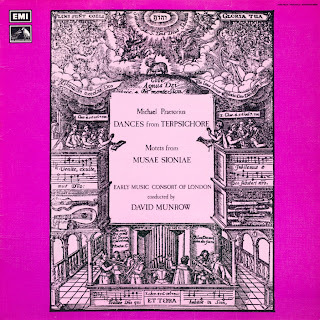 Early AAM recordings in which I played, of Purcell theatre music, the Handel Water Music and La Resurrezione, the Telemann recorder and flute concerto, and the Bach E flat Magnificat, are very happy memories. Playing with Chris was always a joy – he just let the music speak for itself and relied on his players’ instincts. He never imposed his own views on the other performers, though his speeds were sometimes niftier than one might expect! Performances and recording sessions were fun, and I still recall Chris’s infectious giggle. A young man going places. Chris Hogwood on Graduation Day. By kind permission of Gill Munrow. Melothesia, edited by Matthew Locke. [MR340.c.65.1]. CH: I’d like to order a score….but I can’t remember who it’s by. MJ: Well, can you remember the title? MJ: How about when it was written? CH: (thinks)….No…. (brightens) But it did have a sort of Laura Ashley wallpaper cover! Selections from “Motteti del fiore” originally pubished by Antonio Gardane in Venice. An item in the “Laura Ashley” facsimile series published by Cornetto. MR230.e.200.5-9. Coda: all the programmes with which we have illustrated this post are drawn from collections held here at the University Library.